Sick and tired of buying a new pool cover every year ? Try one of ARCTIC ARMORS GORILLA COVERS! They are SUPER STRONG, look nice & neat and are lightweight & easy to put on and take off. Check out our selection of high quality "Best Of Class" Gorilla Pool Covers for Inground Pools listed below. Low discount prices for Internet Surfers are featured here. All covers in stock and ready for immediate delivery. Super strong triple layer construction will not rip or tear. Comes complete with 20 year warranty (5 Years Full) ! 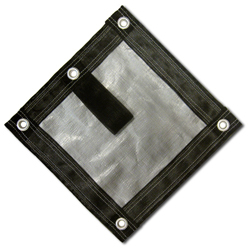 Arctic Armor Gorilla Covers are woven strong/long-lasting polyethylene tapes to produce a cover that will hold up to winters worst. Arctic Armor Gorilla Covers are constructed of an extremely tight weave fabric that does not allow light to pass through. Without sunlight, algae cannot grow! Please note: All sizes listed below are "Pool Size". When choosing a pool cover, order the cover that is the size of your pool. All covers come 5 feet larger for enough overlap to accept waterbags. 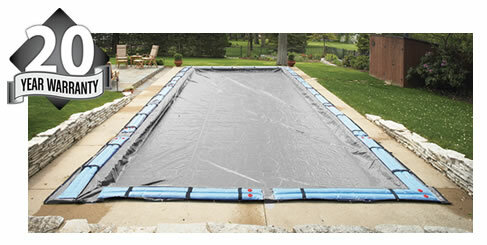 For example, if you have a 16' x 32' pool, you should order the 16' x 32' cover and it will actually be 21' x 37'. The extra fabric makes the cover fit better and will help prevent excessive wear and tear.